Whoooo hoooooo! The mail lady delivered a big box yesterday afternoon and it contained my "Campfire In A Can". Now we can jam outdoors on the deck and keep warm around the "adjustable" propane fire and there is no smoke to get in Marlene's eyes. We'll jam around a low fire all night. Well I'm SOOOOOOO happy with my "campfire In A Can". I had been researching propane fire pits for a few months wanting to purchase the right one for our needs. 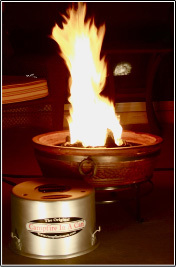 It is extremely well built, compact, efficient, and throws off heat that I have found isn't always the case with some other brands of fire pits. .
I’ve really enjoyed the Camp Fire in a Can; it is super easy to use. I think that my favourite thing is that it can be used under my awning on rainy nights or days. It throws a great heat and at night is provides lots of light to my camp. It is also much cheaper to operate then regular campfire using wood that you’ve purchased. It costs me $6 to fill my 5 lbs propane tank, I get a minimum of 3 nights or more out of a tank; a bundle of firewood in a Provincial Park costs about $8 and only offers 2 to 3 hours of burning….and you can’t shut it off when you’re finished with it! Our family just got back from a five day camping trip to Blake Island here in Puget Sound. We had a fire every night even though there was a burning ban in effect, the kids and grandkids loved it! It's just not camping without a fire. The Ranger stopped buy nearly every night to check out our fire, he would comment on what a great fire it was but that we were making his job more difficult, all the other campers were jealous, we were the only ones permitted a fire in the whole campground! My wife said this Campfire In A Can paid for itself in this one trip, and I agree. Thanks again for a great product. My name is Mike Steffen. You may know me as a writer and contributing editor for RV magazines over the years and as a public speaker at RV conferences and shows. When not working though I'm also a camping NUT ! My family, kids and grand kids treasure the times we can spend together around a campfire watching the kids toast marshmallows or campfire pies while the adults tell story's, truths and perhaps a few tall tails. We have found over the last few years that more and more National, State and private RV parks limit or deny campers from having open campfires. When we show them the CampFire in a Can the first thing the fire police normally ask is "Where can I get one ?" We have both the propane model that we use for much of our outdoor cooking and the wood burning model for campfire gatherings. These are not cheaply made units ! We got our first one about five years ago and it still looks new. Just as one camper to another, take a look and see what you think. By the way, this is my personnel testament to Camp Fire in a Can, NOT a paid promotion. Just thought ya should know. I just received my Campfire in a Can and it was well worth the wait. Your design and implementation were flawless. Your promise was kept. A customer couldn’t ask for more. Thank you for making this product. We will use it and enjoy it with our motor home.